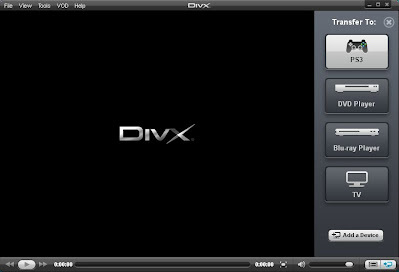 Download free DivX Plus 9 for Windows. DivX Plus file size 70.9MB. DivX Plus is a free video player suite of for Microsoft Windows that contains the DivX Codec, a standalone media player, a video converter and media player Plug-in for web browsers. DivX Plus Player is built to give you the best video playback performance and media management on your PC. DivX Plus Player will allow you to play DivX, AVI, MKV, MP4 and MOV videos, manage your video library, transfer videos to your devices with DivX To Go, navigate your videos with greater speed and precision. DivX Plus Player also serves as a full-featured video library manager. Now you can create video playlists (by genre, date, etc.) as well as manage your downloads, including purchased movies, manage your local and downloaded media files. DivX Plus Player now includes DivX To Go, a new feature that gives you the easiest way to transfer your and automatically format videos to play on any DivX Certified device. Now you can easily transfer your movies, TV shows or home videos to your DVD player, gaming console or more by easily burning a disc or saving to a USB drive.